I helped the children make scary, spider cookies (because they said they wouldn't eat cute, spider cookies), for a story time snack, to go along with a reading of Margaret Bloy Graham's Be Nice to Spiders. In the story, a little boy, whose family has just moved into an apartment, that does not allow pets, leaves his pet spider, in a box, with a note, on the doorstep of the zoo. The spider escapes into the zoo, where it moves from cage to cage, building webs, and dispatching flies, making for happy animals, but messy, web-covered cages. The head zoo keeper orders the webs removed before a mayoral inspection, despite the objections of one of his underlings, who has read that spiders can be useful. I'm sure you can guess the rest - the flies return, and the animals are unhappy, until the zoo keeper realizes his error, and the spider becomes the hero, or rather heroine, of the story. 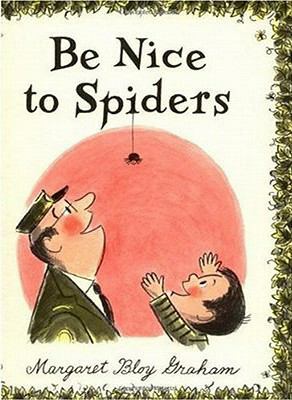 I'm still not a huge fan of spiders, but the children and I enjoyed Graham's sweet, simple story quite a bit. And, as to the cookies, they were also sweet (to taste, anyway) and simple, and we had just about as much fun making them, as we did eating them. In fact, I'm thinking they might become another fall, family tradition for us. I started out with a half batch of chocolate sugar cookie dough, enough to make a dozen spiders (click here for the recipe). Then, before I called the children in, I rolled out four, three inch long, leg pieces for each child, on a greased cookie sheet, the same way you might roll out a play dough snake. ...and the top one up. ...which they placed on top of the legs. They finished off their creations with large and small, M&M, eyes, and fangs, keeping in mind that the balls would flatten some, as the cookies baked. I baked the cookies, as usual, for 14 minutes at 350 degrees Fahrenheit, and served them warm, with our story. Those are too cute. They look great compared to our spiders! About those friendship bracelets you did awhile back, they were a HIT with our co-op class this morning!! Thanks for all the ideas Leah. Marcee - Good to hear!